We just moved into a new apartment a few weeks ago, but unfortunately, there was nowhere convenient to put the litter box to prevent additional messes, smells, or easy access for our dog to dig for chocolate. 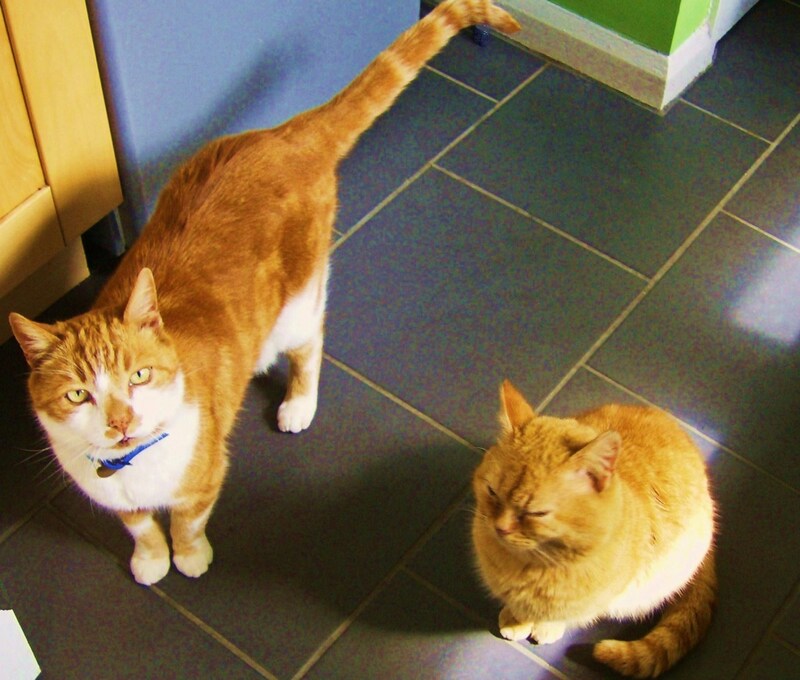 We tried several places: in the bathroom, under the kitchen counter, in one of the bedrooms—nothing was able to hide the unsightliness of a litter box or keep the littler granules relatively contained so that we weren't stepping on them all the time. It had to match our furniture. 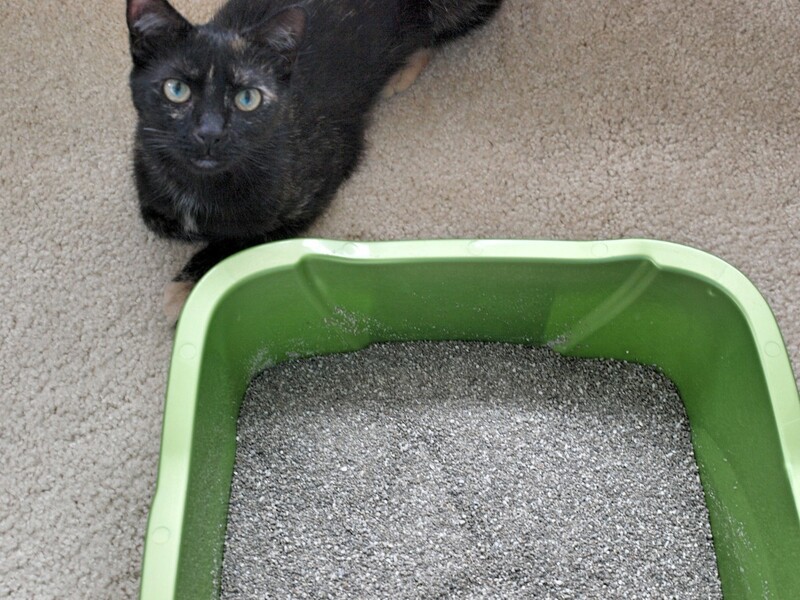 It had to have enough room to fit both the litter box and a little carpet to catch the granules, but it couldn't be large enough that it would be hard to find a place to fit it inside our house. 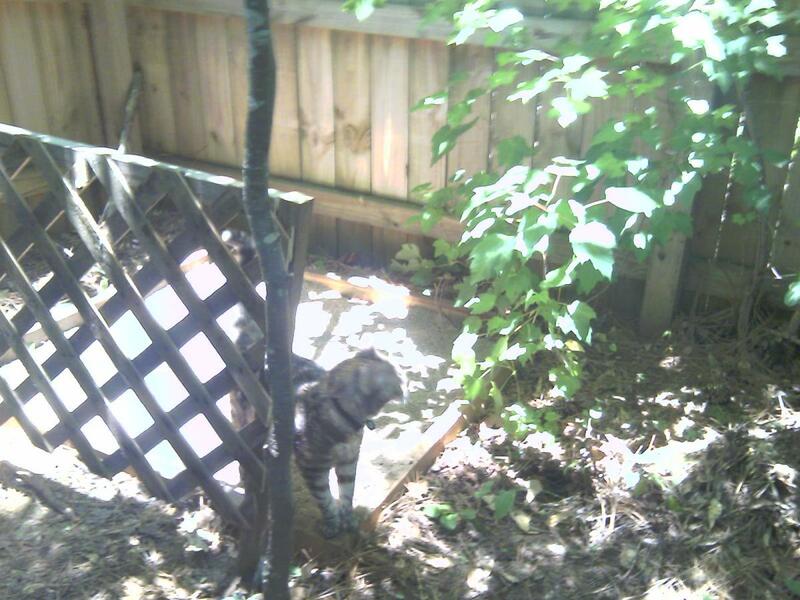 It had to not be inherently obvious that it was hiding a cat litter box. 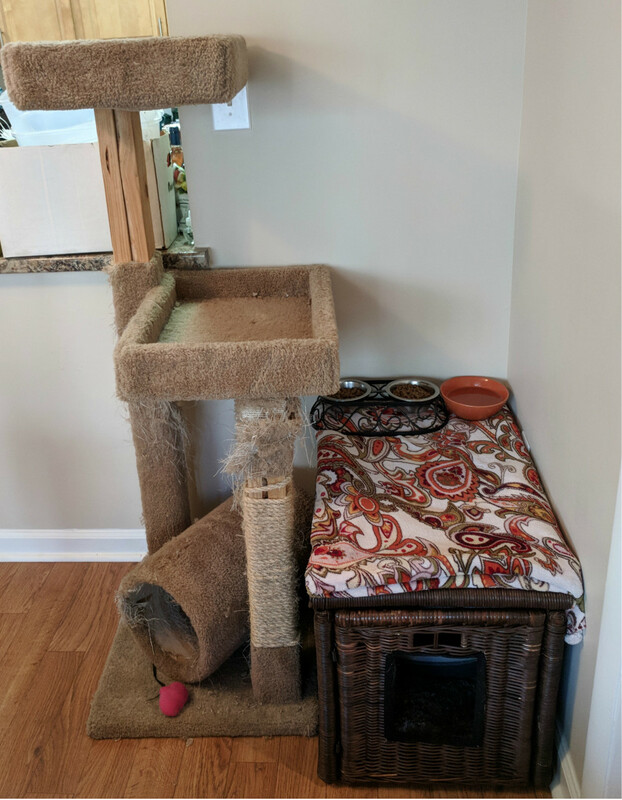 If we found the right cover, there would be a spot to place it in the corner of our dining room where it would be accessible for the cats but also hidden from view for humans. I wasn't finding anything online that I particularly liked or felt reasonably priced enough to purchase (I wanted to keep the whole project under $75). So, I decided I would DIY it. I've done IKEA hacks in the past, so my first stop was to go to IKEA to see if there was anything I could modify to make the litter box cover. One Sunday, Ian and I made the trip out to IKEA and walked through the Showroom and Shopping floor looking for inspiration. I had narrowed it down to a few end tables that I could modify to make it work, even though they were a little smaller than I wanted; they were going to be in my price range but also look nice. 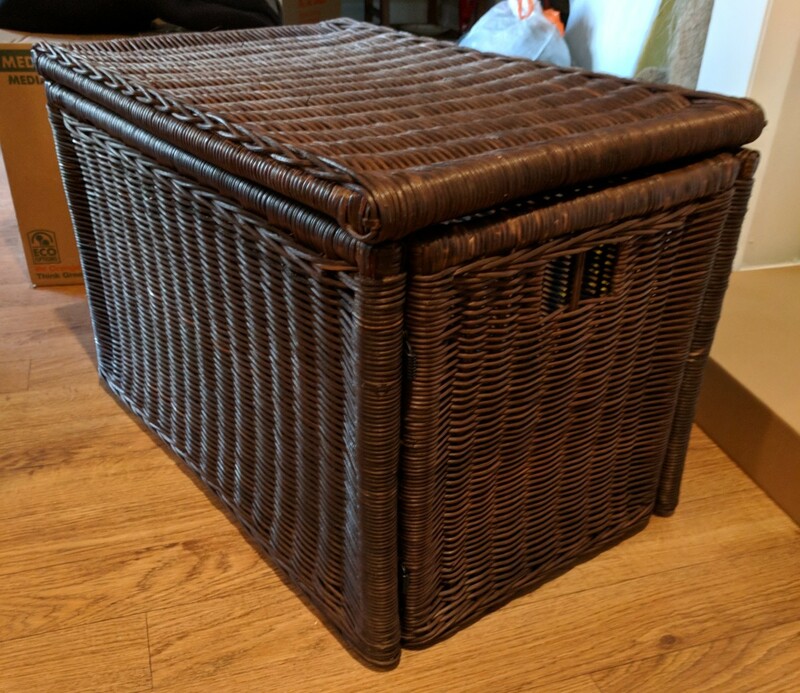 We were going down to the self-serve warehouse when I spotted it: the perfect solution: the GABBIG Wicker Storage Box by IKEA. It was the perfect size. 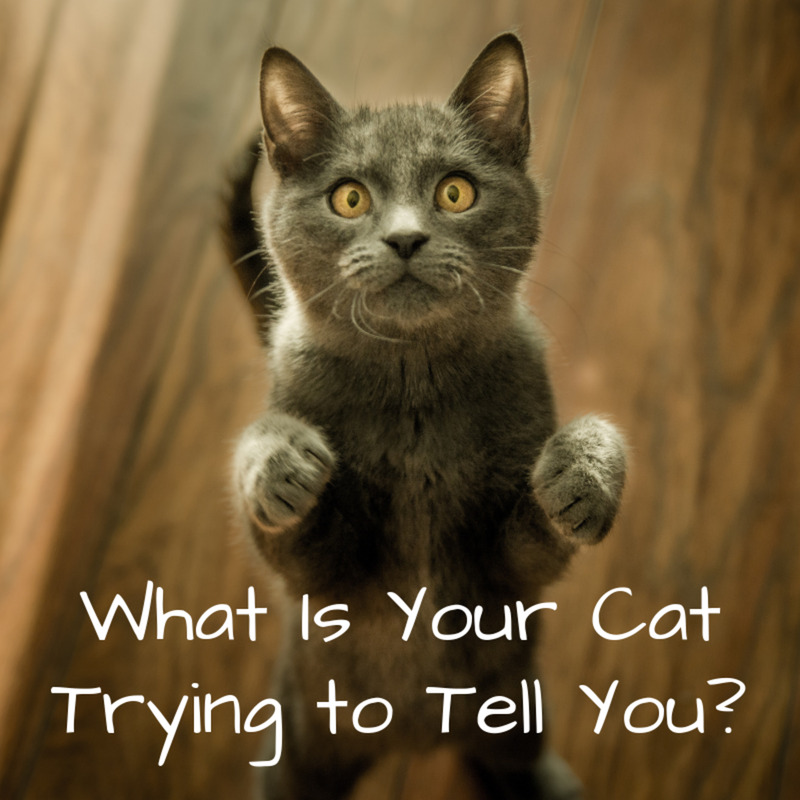 It would fit in the corner of our dining room without protruding into the doorway, it had enough room for a litter box and a carpet, and the cats could stand up in it fully without having to crawl. 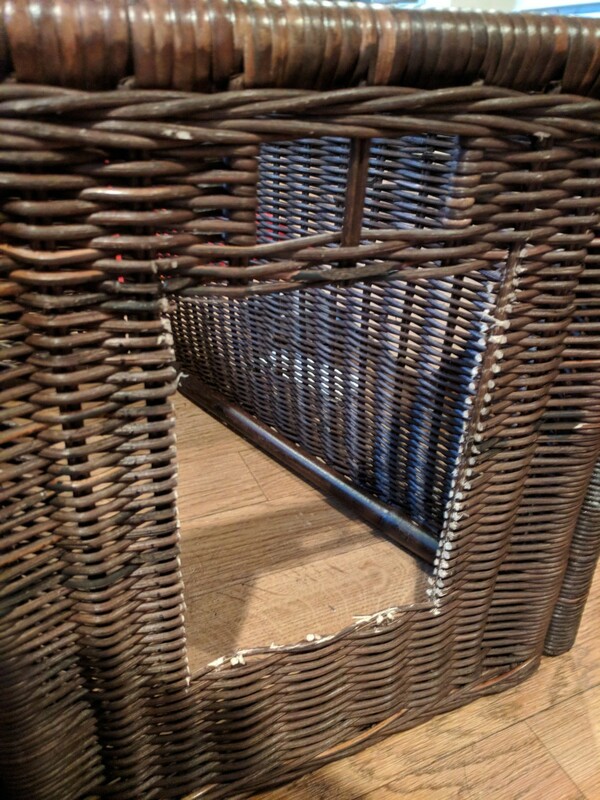 The wicker would be relatively easy to cut an opening into, and strong enough to withstand kitties who like to scratch the walls when burying their chocolate. It would also be easy to paint to make the right color to match our furniture. Best of all, at $60, the box was significantly cheaper and nicer looking than anything I had found online premade. It was a done deal. We walked out with our prize (and many other things, as is what happens when you go into an IKEA store), and I immediately set to work when I got home. It was brought to my attention that IKEA does not sell this hallway box anymore (as of 2019). There are few others you can use instead like this one from Amazon, or a similar one from Bed Bath and Beyond. This project was relatively simple to do and didn't take more than a couple of hours to complete. I only needed a few basic supplies to execute it, and I was able to have it completed the same day that I brought the box home! First, I put the box together to decide which wall I wanted to cut the hole in. I decided on putting the hole in a short side underneath the handle, because of the way I wanted it to sit on the wall in the dining room. The box is easy to put together; all of the sides are already attached, so I just had to unfold the box and put the floor and the cover on top. Next, I cut a piece of cardboard to be about 7x10 inches in size. I centered the cardboard underneath the handle of the box and, using a Sharpie, I traced around the outside of the cardboard onto the wicker so that I would know where to cut. I made sure that the lines I was drawing were directly next to the supports that the wicker is weaved through and not on top, to ensure that the square had enough structure to not fall apart. 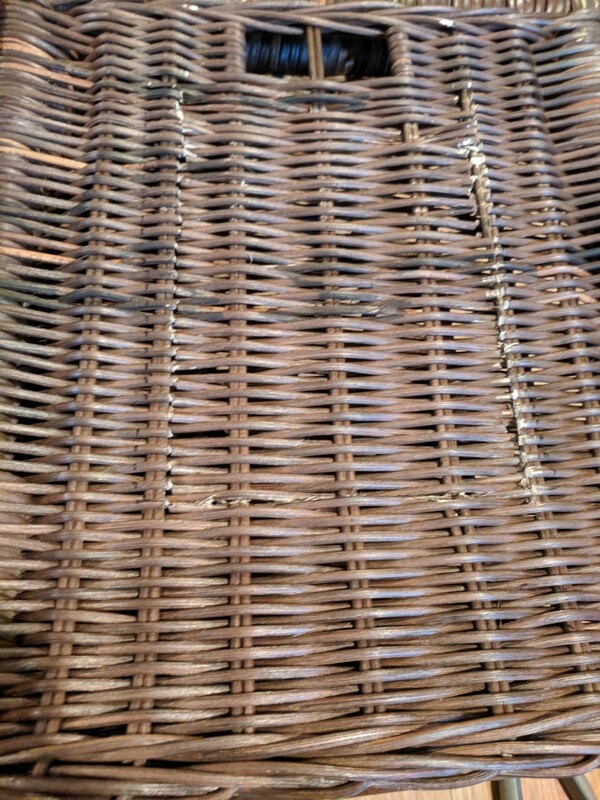 Now started the cutting of the wicker. This step is the most critical that you be careful, for two reasons: one, wicker is brittle and if not cut correctly, you could fracture the whole thread. Two, you're using a very sharp object to cut into a hard object, so there is definitely danger of cutting yourself. At first, I tried to use a knife, but the sawing motion became too difficult for me, so I switched over to an incredibly sharp pair of shears, and gently cut each wicker thread one by one down the shape of my box. This part took the longest. At this point, you could decide to paint the box. I would recommend using a spray paint and also doing it outside, but you could probably also paint using a paintbrush and whatever color you decide on. I decided to keep mine brown for the time being because it matches my dining room. After my square was cut out, I decided I wanted to line the edges of the square I had just cut, to prevent the cats from scratching themselves on wicker as they got in and out of the box, and also to make it look a little more finished. I grabbed my hot glue gun and an old pair of black pants made from a utility fabric (like Dickies work pants). I cut pieces of fabric that were the same length as each side of the square and about three inches in width. Using the glue gun, I drew a line of glue next to the edge of the square on the outside of the box. I attached the fabric to the glue in a way that the edges would be hidden. I folded the fabric over the edge of the wicker and glued it down on the inside so that the fabric laid flat and covered the entire sharp edge of the wicker. I did this for all four sides of the square I cut out. Voila! I had a cat litter box cover. I put the whole thing back together, and placed it in a corner. I laid a bathroom rug in the bottom of the box, put the cat litter box in, and stuck the cover back on. The cat litter box cover I made with the Gabbig storage box is everything I needed for the space, cost, and look that I wanted. I do think this project could be done with another type of wicker box if you wanted, but you just have to make sure it's the structured, hard wicker and not the soft braided wicker, because I don't think soft-braided wicker will hold its shape very well if you cut a hole in it! Another disclaimer: This box is not designed to be picked up with everything still inside. 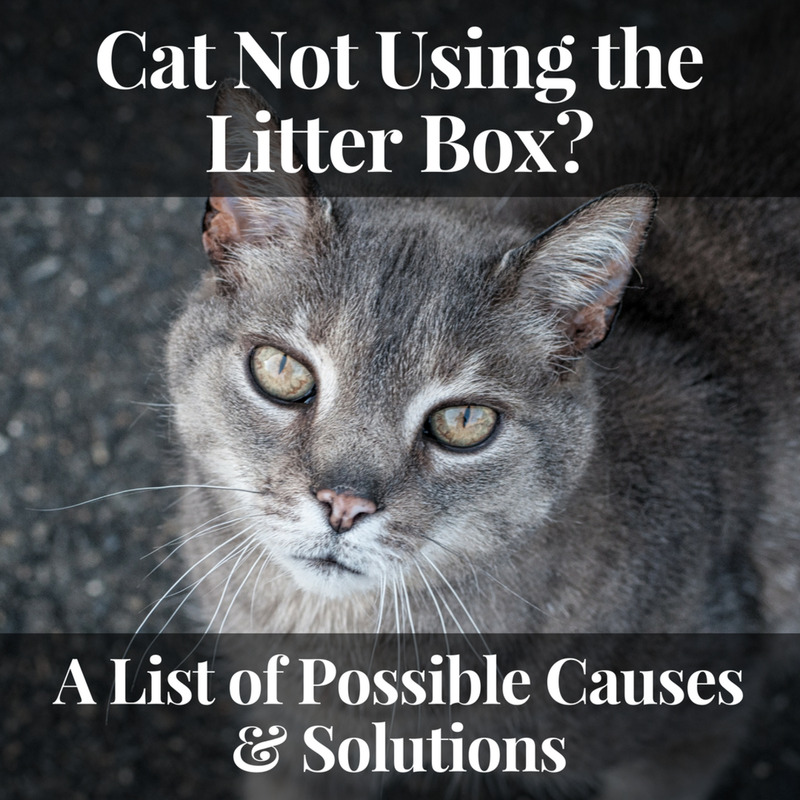 With the weight of the cat litter box, the bottom of the box will fall out if you pick it up altogether, which you shouldn't need to do. 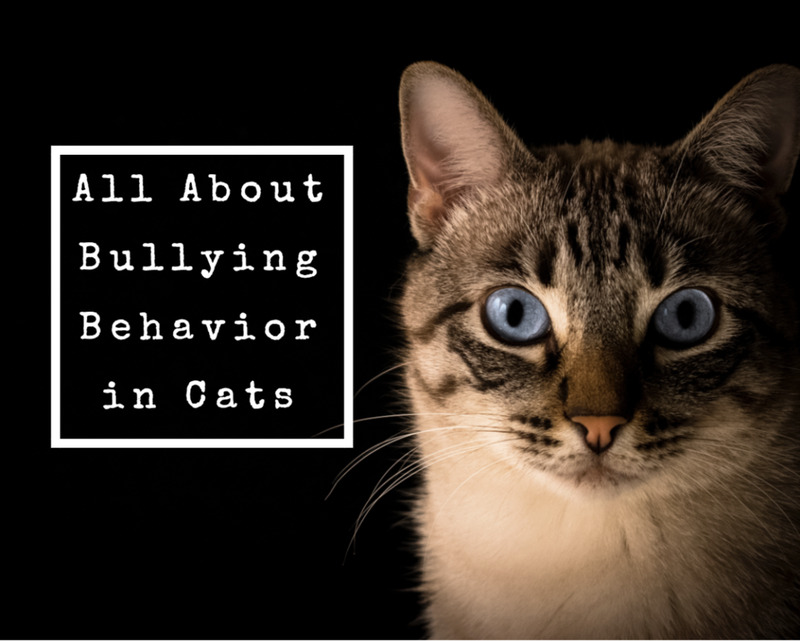 When I change the cat litter, I take the top off the box and pull the cat litter box out, do my thing, and then put it back in the box! 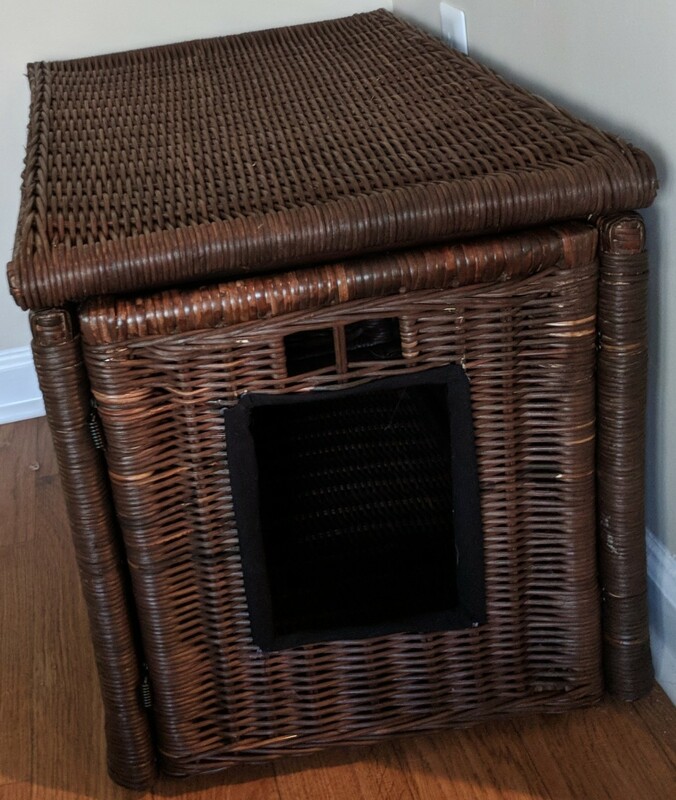 For all you cat lovers out there also looking for other solutions to handle your kitties' business, this wicker box is a great solution to hiding the litter box in plain sight. 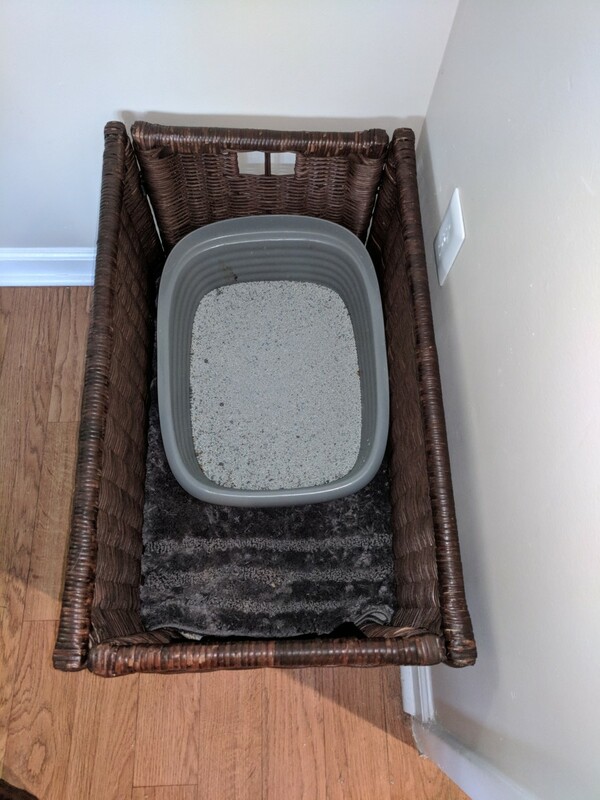 If you're looking for another easy and cheap piece to add to your routine, I'd also recommend to you this Arm & Hammer Sifting Cat Litter Box. 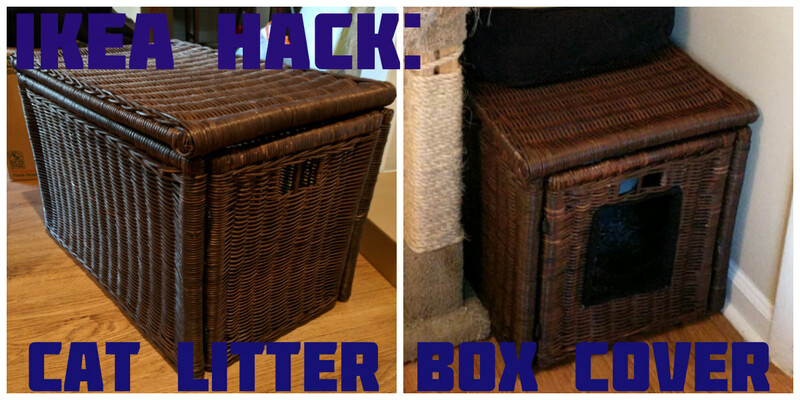 It does not work as well with non-clumping or pine/paper-based litters, but works great with any clumping litter. It's also the perfect size to fit inside the Gabbig wicker box. Thanks Peggy! 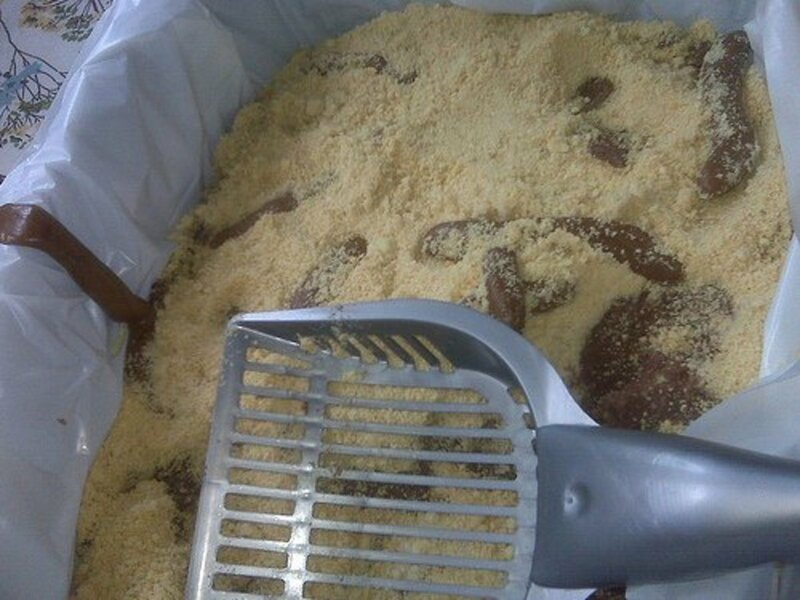 Putting the cat food and water on top is helpful to keep the dog out of the cat food, because she is too short to reach! What a great idea! Right now we simply put our cat litter box in our master bedroom bathtub. We prefer using our shower so not being able to use the bathtub is no problem. Most people never see it so it works for us. But to be able to hide it within view of others and have it camouflaged as you did is ingenious. I like how you also have your cat dishes of food and water on top of it.